On the weekend, Ottawa played host to the 2017 Red Bull Crashed Ice. 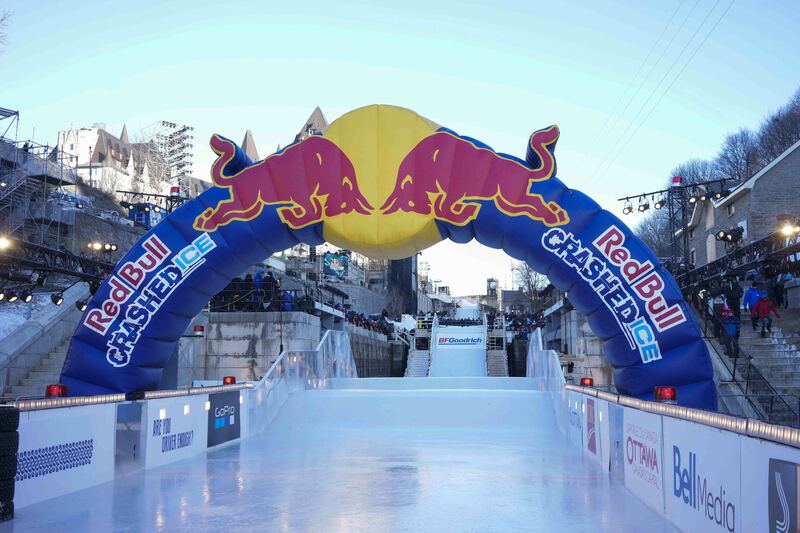 Crashed Ice is a fast sport consisting of skates and frozen ice sloping down in curves and bumps. Riders from females and males compete for the fastest speed going down the ice. There were lots of bumps, trips, stumbles and slip during the whole competition. The event was part of the continuing celebration of Canada’s 150th birthday and in the Nation’s Capital. It was located on the Rideau Canal between Fairmont Chateau Laurier and Parliament Hill. The weather on Saturday was hovering around -20 degrees Celsius, quite the bone chilling temperatures. At least people braved the cold temperatures at the event. I stood with other photographers from around 4pm to 10pm. It was about a 6+ hours standing in the frigid cold. Overall, it was a fun event to watch ice cross downhill. You can check the photos below. The first ever Ice Dragon Boat Festival in North America happened on Saturday morning. It was held at Dow’s Lake in Ottawa. The unexpected mild temperature was pretty ideal to begin the opening ceremony. The lion dance troupe led the VIPs and politicians to the Rideau Canal Skateway. The Minister of Canadian Heritage, Melanie Joly and Minister of the Environment, Catherine McKenna were on hand for the event. As usual, the mayor of Ottawa, Jim Watson and other local politicans were there for the event. Boats on ice don’t seem in common compared to the usual boats on the water. The Ice Dragon Boat race have been a big hit in Hungary and China so far. Teams from Canada, China, Europe and USA have applied for the first inaugural race in Ottawa. I didn’t get to stay to check the race as I was there for the lion dance performance. There was a good turnout for the Ice Dragon Boat Festival as it’s part of the 2017 edition of Winterlude as one of the new attractions. It is also part of the continuing celebration for Canada’s 150th anniversary and Ottawa 2017. Check out the photos from the opening ceremony below. All in all, it was great to be at Beau’s Oktoberfest and it was quite a big turnout as people will have fun and drink beer.